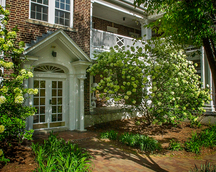 68 N French Broad Avenue Studio in North/Downtown Asheville - Leslie & Associates, Inc. The grand and glorious Carolina has been restored to its original Southern charm, just as it was in the 1920s. 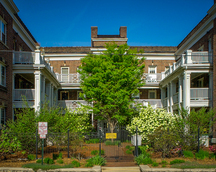 Completely restored in 1995, the Carolina retains its original hardwood floors and incredible city or mountain views, but features all new plumbing, wiring, and mechanicals, natural gas heat, central A/C, and fully-equipped kitchens. Large, airy apartments. Range/fridge/dishwasher/disposal. Coin-operated laundry on site. No parking. Adult cat OK on approval with additional fees. From downtown Asheville, I-240W to Montford Ave exit, turn left across interstate bridge, left on Haywood St., right on N. French Broad; Carolina is on rt corner (3-story), U-shaped red brick building with landscaped courtyard and wrought iron fence).